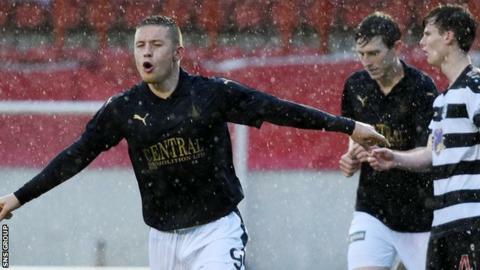 Falkirk turned in a strong second-half display to rout East Stirlingshire in the opening round of the League Cup. Aaron Muirhead's powerful volley from distance gave Shire keeper Richard Barnard no chance as it clipped the crossbar on its way in on 17 minutes. After the break, John Baird's exquisite lob doubled the lead, before William Vidler put through his own net. Robert McHugh and Blair Alston completed the scoring at Clyde's Broadwood Stadium. The match was switched to accommodate Saturday's Tom Jones concert at the Falkirk Stadium and the Bairns enjoyed a good evening away from the green, green synthetic grass of home. Match ends, Falkirk 5, East Stirling 0. Second Half ends, Falkirk 5, East Stirling 0. Will Vaulks (Falkirk) is shown the yellow card for a bad foul. Corner, Falkirk. Conceded by Reece Donaldson. Scott Shepherd (Falkirk) wins a free kick in the defensive half. Foul by Robert McHugh (Falkirk). Reece Donaldson (East Stirling) wins a free kick in the defensive half. Attempt missed. Peter Grant (Falkirk) header from the centre of the box misses to the left. Attempt saved. Max Wright (East Stirling) right footed shot from more than 35 yards is saved in the top centre of the goal. Attempt saved. Andrew Kay (East Stirling) right footed shot from the left side of the box is saved in the bottom left corner. Substitution, East Stirling. Andrew Kay replaces Billy Vidler. Substitution, Falkirk. Alex Cooper replaces David Smith. (Falkirk) wins a free kick in the defensive half. Attempt saved. Kristopher Faulds (East Stirling) right footed shot from very close range is saved in the centre of the goal. Billy Vidler (East Stirling) wins a free kick in the defensive half. Goal! Falkirk 5, East Stirling 0. Blair Alston (Falkirk) right footed shot from the centre of the box to the centre of the goal. Assisted by Robert McHugh. Hand ball by Reece Donaldson (East Stirling). Attempt missed. Max Wright (East Stirling) right footed shot from very close range is just a bit too high. Kristopher Faulds (East Stirling) wins a free kick in the attacking half. Substitution, Falkirk. Scott Shepherd replaces John Baird. Corner, Falkirk. Conceded by Billy Vidler. Goal! Falkirk 4, East Stirling 0. Robert McHugh (Falkirk) right footed shot from very close range to the top left corner. Assisted by Craig Sibbald. Substitution, East Stirling. Ally Roy replaces Michael Wallace. Own Goal by Billy Vidler, East Stirling. Falkirk 3, East Stirling 0. Corner, East Stirling. Conceded by Aaron Muirhead. Hand ball by David Smith (Falkirk). Corner, Falkirk. Conceded by Jon Tully. Attempt missed. Luke Leahy (Falkirk) right footed shot from the centre of the box is just a bit too high. Corner, Falkirk. Conceded by Richard Barnard. Attempt saved. David Smith (Falkirk) right footed shot from the right side of the six yard box is saved in the bottom right corner. Foul by Michael Wallace (East Stirling).